The best way to support your customers is to provide support agents with a 360-degree view of the customer. This view is across interaction channels like web, email, chat, support tickets, even social media. Connect these interactions with the products and services you know the customer has purchased and now you can better serve them. Further, with AI-powered search integrated into your customer support platform, your agents can be pushed the right information automatically, based on the content of the client’s ticket, regardless of the repository the answer lives in. So if a client has an issue with their refrigerator, the agent can immediately see other related tickets and resolutions associated with the same issue the client is reporting. 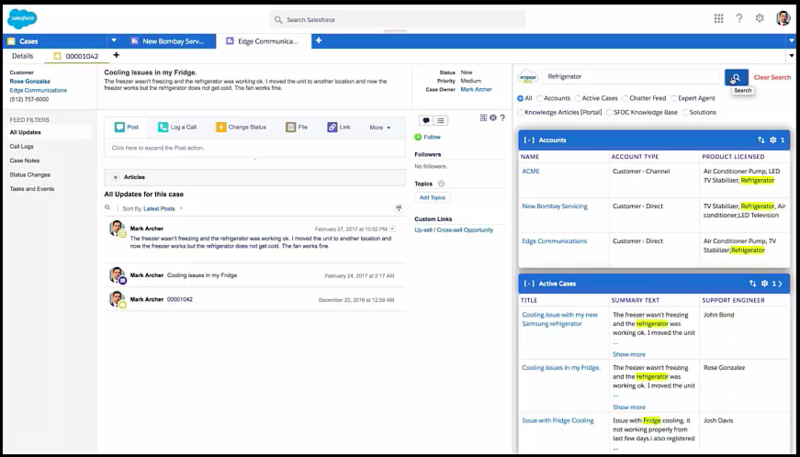 An example of this is shown below, which illustrates the power of the Attivio platform integrated with Salesforce.com, known as Engage360. A traditional search solution couldn’t do what Engage360 does. There’s a lot more going on behind the scenes than indexing a lot of information. What does Engage360 use? It leverages the Attivio Platform and its combination of natural language processing, text analytics, and machine learning to surface the right information when it’s needed. AI brings a number of benefits to the table. First, it provides information intelligence through the analyzing and indexing of data using NLP and text analytics. This ensures the most relevant information is surfaced quickly. Second, it incorporates behavioral intelligence through the analysis of customer interactions. Here again, the solution leverages machine learning, NLP and text analytics. Combined, you have AI-powered insights and search that not only lets you ask a question and get the most relevant answer, but also anticipates your needs and delivers relevant information and insights even before you ask for it. It’s also important to point out that this is not a one-time analysis. With machine learning, the solution gets smarter over time, learning and evolving as you use it, as products change, customers do or ask more, and you add more knowledge to the system. An AI-powered search solution helps support teams work smarter. But in the end, it’s the customer who is on the winning side - they get answers faster, their experience is improved greatly, and they happily let others know how good your company is to deal with. So, I only have this one question for you: What are you waiting for? Start building better customer support experiences today. Contact us to learn more.